Wisam Salim took over as manager for HÖRS in Linköping last autumn. With his background in the entertainments industry, he is now planning more activities for co-workers. First out is beer tasting. Universitetsklubben is here to serve LiU’s co-workers. This is a place for meeting, spending time together and eating, following the international model of a faculty club. The club in Linköping is run by HÖRS, Högskolerestauranger i Sverige. When Wisam Salim took over as manager, however, he soon saw that the opportunities for co-workers to engage in activities here are rather limited. He is an old hand at organising experiences and activities. 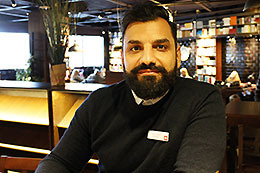 Wisam Salim was for many years manager of operations for the restaurant department at Astrid Lindgren’s World in Vimmerby. This was followed by head of catering in Vimmerby Municipality, where he inspired half of the municipality’s employees to start baking sourdough bread after arranging a talk from the French baker, Sebastien Boudet. The initial focus is on monthly evening activities, following the concept of “After Work”, which people are used to. 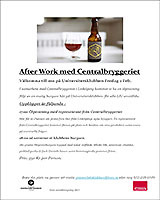 The first will be 2 February, with beer tasting in collaboration with Centralbryggeriet. The brewery will be here to provide information about its products and to provide tasters of some different types of beer from Linköping’s own brewery.